Energy is everywhere and in everything. It is life force itself – there is no place that energy does not reside. From the smallest to the grandest of scales – energy exists. Energy can be “seen or unseen” by the human eye and perception. Energy is not good or bad it just “is” – until we put a label on it or assign it a form thus birthing it into creation – energy does not have a good or bad attached to it. Universally – energy is energy. It is human perception/action that assigns “good” and “bad” which then effects the general human mass consciousness pool. Good news is all energy can be shifted – so if it is perceived as bad it can be cleaned up and used for good, but that’s a whole other sharing. 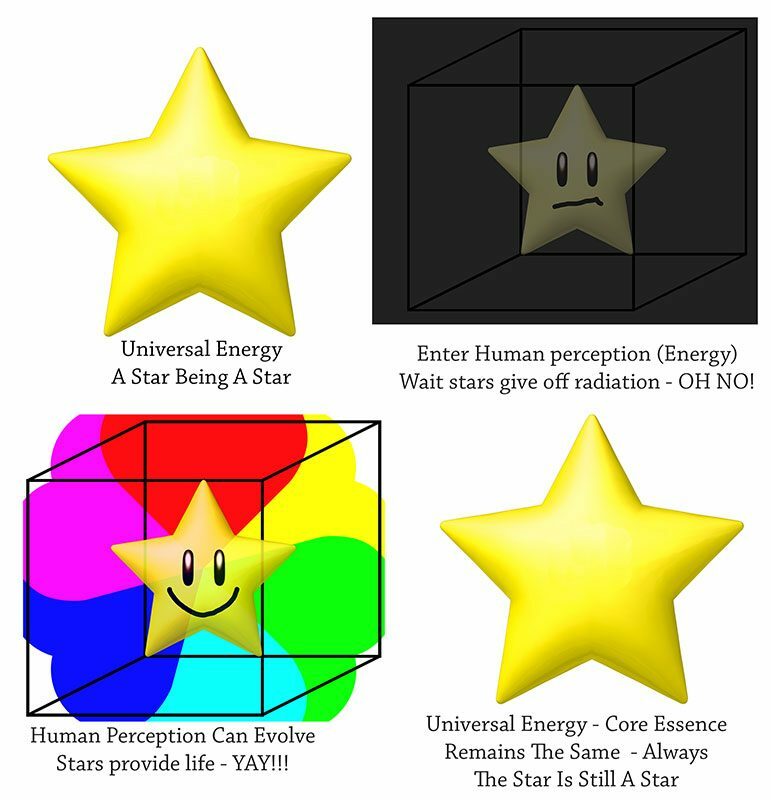 The illustration below gives a basic example of Energy and how human perception shifts the reality of the energy – a star at its core is just a star – as humans put our attention on it and give it a label we then put it in our box of perception and assigning the star an energy shown in the following two boxes fear vs love but as you know the core essence of the star still remains a star.